Try this experiment: Imagine that space aliens really come to earth and really have, as I think is very unlikely, developed the ability to travel to earth while simultaneously remaining so primitive as to violently attack the places they visit. In contrast to the space aliens, could you identify as an earthling to such an extent as to diminish your other senses of identity? “Earthlings — F— Yeah!” “We’re Number 1!” “Greatest Earthlings on Earth!” And can you hold that thought, in the absence of the space aliens, and rid yourself of any notion of opposing any other or foreign group, while still holding that earthling thought? Alternatively, can you cast climate change and environmental collapse in the role of the evil alien Hollywood monster against whom humanity must unite? Or try this one: Imagine that various species of humans survived to the current day, so that we Sapiens share the earth with the Neanderthals, the Erectus, the tiny little Floresiensis, etc. [i] Could you form your identity in your mind as a Sapiens? And then, can you hold that thought while either imagining the other species back out of existence or imagining learning to be as respectful and kind to the other species of humans as we should perhaps actually be attempting to be to other types of living human and non-human earthlings right now? Perhaps the most powerful tool for altering habits of thought about groups of people is role reversal. Let’s imagine that for whatever reasons, beginning some seventy years ago North Korea drew a line through the United States, from sea to shining sea, and divided it, and educated and trained and armed a brutal dictator in the South United States, and destroyed 80 percent of the cities in the North United States, and killed millions of North USians. Then North Korea refused to allow any U.S. reunification or official end to the war, maintained wartime control of the South United States military, built major North Korean military bases in the South United States, placed missiles just south of the U.S. demilitarized zone that ran through the middle of the country, and imposed brutal economic sanctions on the North United States for decades. As a resident of the North United States, what might you think when the president of North Korea threatened your country with “fire and fury”? [ii] Your own government might have gazillions of current and historical crimes and shortcomings to its credit, but what would you think of threats coming from the country that killed your grandparents and walled you off from your cousins? Or would you be too scared to think rationally? This experiment is possible in hundreds of variations, and I recommend trying it repeatedly in your own mind and in groups, so that people’s creativity can feed into the imagination of others. Imagine that you’re from the Marshall Islands seeking restitution for nuclear testing and/or the rising seas. [iii] Imagine you’re from Niger and less than amused that Americans first hear about your country when their government pretends that Iraq purchased uranium in your country, and that Americans only learn about their own military’s actions in your country when the U.S. president is rude to the mother of a deceased U.S. soldier. [iv] Imagine you’re my friends from Vicenza, Italy, who found local and national majority support for blocking the proposed construction of a U.S. Army base but couldn’t stop it — or similar people in Okinawa or Jeju Island or elsewhere around the globe. And don’t just imagine you’re the other people. Learn and then re-tell the stories with all the details inverted. It’s not Okinawa. It’s Alabama. Japan is filling Alabama with Japanese military bases. The towns and state are opposed, but craven politicians in Washington, D.C., are going along. The military airplane crashes happen in Alabama. The spread of prostitution and drugs happens in Alabama. The local girls raped and murdered are Alabaman. The Japanese troops say it’s for your own good whether you think so or not, and they don’t really care what you think. You get the idea. This can be done with wealth distribution, with environmental impact, with militarism, with any issue under the sun. The danger of over-simplification should be resisted. The idea is not to stupidly convince yourself that all Americans are 100% evil while all Japanese are some sort of angels. The idea is to reverse some key facts and see whether anything happens to your attitudes. If not, then perhaps your attitudes were fair and respectful to begin with. Another nominee for most powerful tool for altering habits of thought about groups of people is what goes by the very odd name “humanization.” This is the process wherein you supposedly take a human being or group of human beings, and by learning their names and facial expressions and little idiosyncrasies, you “humanize” them, and you come to the conclusion that these humans are . . . wait for it . . . wait for it . . . humans. Now, I’m 100 percent in favor of this to whatever extent it is needed and works. I think Americans (and probably most people) should read more foreign books, learn more foreign languages, watch more foreign films, and travel more in ways that truly involve them in foreign cultures. I think students should be required to spend a year as exchange students in foreign families and schools. I think a key test of childhood education in the United States should be: What have these children learned about all of humanity, including the 96% outside the United States? 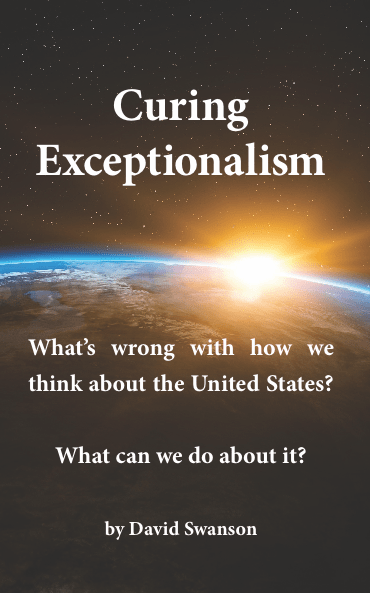 David Swanson’s forthcoming book from which this is excerpted is called Curing Exceptionalism: What’s wrong with how we think about the United States? What can we do about it? (April, 2018). [i] This scenarios was suggested to me by this book: Yuval Noah Harari, Sapiens: A Brief History of Humankind Paperback (Harper Perennial, 2018). [ii] https://www.nytimes.com/2017/08/08/world/asia/north-korea-un-sanctions-nuclear-missile-united-nations.html (January 16, 2018). [iii] Marlise Simons, “Marshall Islands Can’t Sue the World’s Nuclear Powers, U.N. Court Rules,” New York Times, https://www.nytimes.com/2016/10/06/world/asia/marshall-islands-un-court-nuclear-disarmament.html (October 5, 2016). [iv] David Caplan, Katherine Faulders, “Trump denies telling widow of fallen soldier, ‘He knew what he signed up for’,” ABC News, http://abcnews.go.com/Politics/trump-denies-telling-widow-fallen-soldier-knew-signed/story?id=50549664 (October 18, 2017). [v] Jodi Rudoren, “Israel Backs Limited Strike Against Syria,” New York Times, http://www.nytimes.com/2013/09/06/world/middleeast/israel-backs-limited-strike-against-syria.html?pagewanted=all (September 5, 2013).